Canadian pianist Leonard Gilbert is among a handful of promising young artists making their mark in the piano world. He has been singularly successful the last few years in competitions. 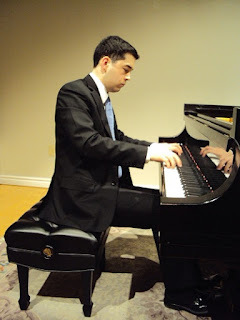 Four-time winner of the Canadian Music Competition, Gilbert won the Third Canadian Chopin Competition in 2010, which allowed him an entry into the 16th Chopin International Piano Competition in Warsaw in fall 2011, the only Canadian in the field. He also had success at the American Paderewski Competition in Los Angeles, the Toronto Symphony Orchestra Competition, and the World Piano Competition in Cincinnati. A student of the famed pedagogue Menahem Pressler at Indiana University, Leonard Gilbert combines technical prowess with uncommon musicality. 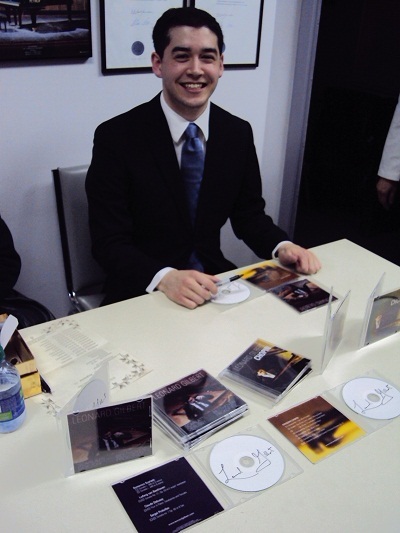 A young Steinway artist, Gilbert gave a recital to a packed house at Euromusic's Steinway Piano Gallery in Markham, Ontario on St. Patrick's Day. He opened with Bach's "Sheep May Safely Graze", a familiar aria from Cantata BWV 208 with transcription by Petri. Then he proceeded to Beethoven's Sonata in A flat major Op. 110, which rounded out the first half. 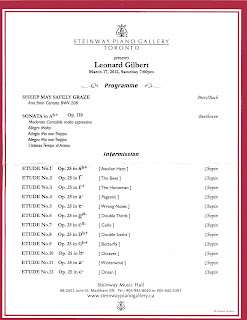 After a 15 minute intermission, Gilbert returned for twelve Chopin Etudes, Op. 25. The enthusiastic audience gave him repeated ovations. 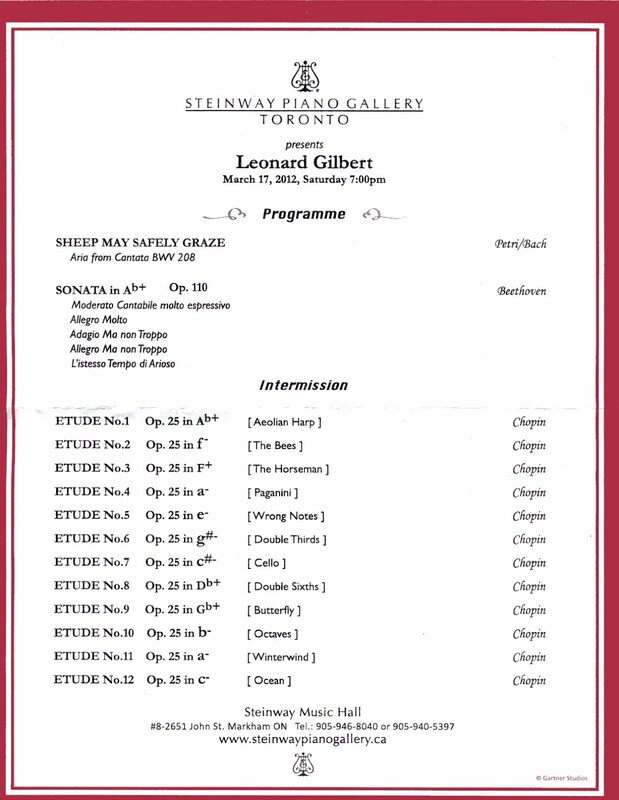 They were rewarded with two encores, a Chopin Waltz and La Campanella by Liszt. Overall, it was a very enjoyable program. I liked his Chopin Etudes the best. The "Book Two" Op. 25 Etudes followed the "Book One" Op. 10 by four years. The Op. 25 pieces all have "nicknames" the likes of Bees, Butterfly, Winterwind etc. The colours and rhythms of each piece is meant to imitate or evoke a particular instrument, animal, or a naturally occurring phenomenon. Playing with fluidity and clarity, Gilbert captured beautifully the essence of each piece. In some of the pieces he made a very big sound, perhaps bigger than necessary given the intimate venue, a modest room that sits perhaps a hundred people. If I were to nitpick, I do find his "Sheep May safely Graze" more of a work in progress. On this occasion, his playing while note-correct needed clearer phrasing and a surer sense of the rhythmic pulse, with some well-placed rubati and stronger sense of chiaroscuro. It's not an easy piece to bring off - an artist the stature of Olga Kern said when I interviewed her recently that she doesn't yet have the courage to play Bach in public, presumably because of its exacting nature. A similar sentiment was expressed to me back in 2008 when I interviewed Montreal Competition winner Nareh Arghamanyan who considers playing Bach a pinnacle and a real challenge. Given Gilbert's youth, further maturity and deepening of his art can be expected, and I look forward to his next recital.